My book Hunting Big Whitetails has earned 5-Stars in Customer Reviews on Amazon.com, and is now in it’s third printing! Hunting Big Whitetails is a book about deer hunting for mature bucks in the “real world.” It is packed with practical deer hunting tactics that the author has used on farms and on public land. Many books about hunting trophy deer are filled with pictures of large bucks killed on exclusive private ranches or on guided hunts in Canada or elsewhere. While those hunts are great for those who can afford them, Hunting Big Whitetails is a book for the rest of us. And, should you be lucky enough to hunt Alberta or one of those big ranches someday, with these tactics you’re odds will be even higher! 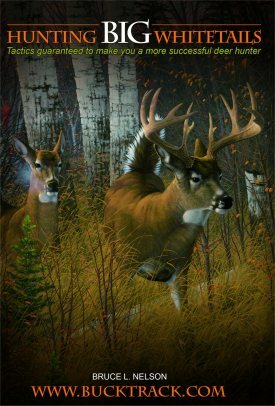 Real-life hunting stories illustrate the tactics about hunting from deer stands, still-hunting, deer drives, snow tracking and recovering wounded deer. You’ll also find lots of practical information including the habits and habitats of whitetail deer, gear and clothing, and shooting. 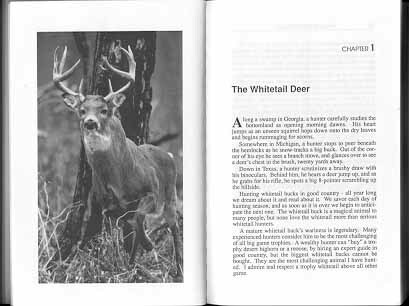 Hunting Big Whitetails has 272 pages, and is a 5 1/2″ by 8 1/2″ illustrated softcover book. It has over 60 photos, drawings and charts. Hunting Big Whitetails has also been recommended by Ontario Out-of-Doors, BOWHUNTER, New Jersey Outdoors, The Morning Call, BC Outdoors, Midwest Book Review, the Small Press Book Review, and many others. To see many more pictures of big bucks readers of Hunting Big Whitetails have taken, Click Here.